Hard Disk Scrubber is a free file shredder program that can not only delete multiple files at once but also shred files you've already deleted. Some advanced settings are adjustable, such as creating custom deletion methods and choosing to overwrite files with random data but without deleting them. 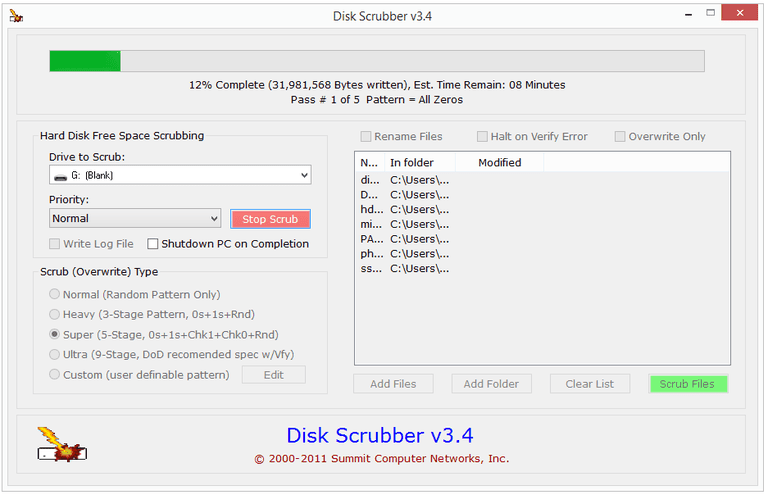 This review is of Hard Disk Scrubber version 3.4, released on October 28, 2011. Please let me know if there's a newer version we need to review. Hard Disk Scrubber supports removing multiple files at once, as well as erasing files you've already deleted, called Free Space Scrubbing. You can also build a custom wipe pattern by defining the text that Hard Disk Scrubber should use to overwrite the data, such as numbers, special characters, and letters, as well as specific patterns of zeros and random data in any custom order. Use the Add Files button to select one or more files to add to the queue, or choose Add Folder to easily add a group of files that are contained in a folder. The Add Folder option does not enable folders to be deleted — it's just a simple way to add that one folder's files to the queue. Hard Disk Scrubber also has an option to rename files in addition to shredding them. When you choose this option, each file is renamed first and then run against the selected sanitization method, which makes it even harder to recover with file recovery software. You can also choose Overwrite Only to overwrite the selected data but not remove it from the hard drive. The two options I just mentioned can be used simultaneously to create files with TMP extensions that are written with random data but aren't actually deleted. When using the optional Free Space Scrubbing feature, you can write events to a log file, shutdown the computer when it's finished, and give Hard Disk Scrubber priority over other running programs. Hard Disk Scrubber is an interesting program because. On one had it's both advanced and unique, and on the other, sort of basic and even lacking in a few ways. The one seemingly small thing I don't like about Hard Disk Scrubber is that drag and drop isn't supported. This means you must browse for files and folders to add them to the queue, which, in my opinion, takes much longer than drag and drop. Another problem I have with Hard Disk Scrubber is that you can't remove folders from the hard drive. You can import folders, which will, in turn, add the folder's files to the queue, but neither the folder nor the subfolders and their files will be removed. All that said, there are plenty of things I like about Hard Disk Scrubber, such as the fact that there are absolutely no settings other than what you see on the program window, which helps keep things simple. I also like that you can define your own overwrite method. This is a relatively simple feature that I wish other hard drive scrubbers would implement. If Hard Disk Scrubber could remove folders and added support for drag and drop, it would certainly rank higher on my list of free file shredders.